A Milwaukee police officer stands before the remains of a bar last summer, after police there faced off with protesters following the police shooting of a black man. For decades, interactions between police and people of color in the Midwestern city have been fraught, and those encounters are the subject of a new lawsuit brought by the ACLU. A police cruiser with two officers in it signaled for their car to pull over. Collins, then 64, worried that he was about to get a ticket. "At the time, [the officer] said, 'I'm not the ticket police,' and I said, 'OK — I'm good with that,'" he chuckled as he told me this part of the story. But if he wasn't being pulled over for a moving violation, why were the police stopping him? The officer took his identification, went back to the cruiser and returned a few minutes later. They told the couple they were free to go. They did not receive a citation, summons or explanation. Their mood soured, Collins and his wife drove straight home. "You know how you feel after an encounter like that," he said. "We were wondering, what was that all about?" What frustrated him, he said, is that he was usually on alert for the city's police as he drove, but that day, with his wife, he had been relaxed and not paying attention. Collins, a Milwaukeean for most of his life, had been stopped by the Milwaukee police before, as had his son, whom he described as a straight arrow. For black men here, he said, encounters with the police are a rite of passage. "That shouldn't be your normal, but that's what it was," Collins said. In most instances of stop-and-frisk, officers canvass certain neighborhoods to stop and question pedestrians and motorists they deem suspicious; if the officers suspect the person they stopped is carrying contraband, like drugs or guns, they can proceed to frisk them. Nusrat Choudhury, a lawyer with the ACLU, said that there was often no reason cited for the stops in the written reports that officers filed. "Where a reason could have been supplied, there was 'none' or vague descriptors like 'suspicious person' or 'suspicious vehicle,'" she said. Choudhury said that none of the thousands of police records the ACLU examined indicate whether a frisk occurred following a police stop, much less whether there was any basis for a frisk, which "raises the red flags that innocent people are being stopped and questioned [and frisked." The ACLU's lawsuit calls for an end of stop-and-frisk by the Milwaukee Police Department. But the city's police chief, Ed Flynn said in a written statement to the Milwaukee Journal-Sentinel that the department "has never used the practice of stop-and-frisk, nor has there ever been a quota for traffic stops." Flynn went on: "However, traffic stops in high-crime areas have been proven to reduce the number of non-fatal shootings, robberies and motor vehicle thefts." Choudhury says that Greg Chambers, another plaintiff in the suit, was not stopped in an area known for high crime, per Chief Flynn's explanation, but for "race out of place" — being black in a neighborhood that is not. In big cities across the country, stop-and-frisk policies have been contentious, and possibly the best-known application of the debunked "broken windows" philosophy of policing, which holds that aggressive policing of low-level, petty infractions prevents more serious crime from occurring. In recent years, stop-and-frisk has been the subject of lawsuits in cities across the country. Critics say that the practice violates constitutional protections against unlawful search and seizure, and that flooding black and Latino neighborhoods with police who have a wide berth to stop anyone for any reason is tantamount to racial profiling. They also argue that the practice rarely yields "hits" on illegal activity or contraband. The ACLU lawsuit rests atop Milwaukee's history of discord between the police and black residents, stretching back to when blacks moved from the South to the Midwest en masse during the Great Migration. During the tumultuous 1960s and 1970s, Harold Breier, the city's combative, all-powerful police chief, regularly antagonized the city's black communities, who said that Breier's department brutalized and mistreated black residents. The city remains among the most racially segregated in the country, which means that black and white residents are having vastly different experiences with policing in volume and texture: a report from the Public Policy Forum last year found that black people made up 72 percent of all arrests for marijuana possession in Milwaukee, while there is no evidence that black people use marijuana at vastly different rates than white people. 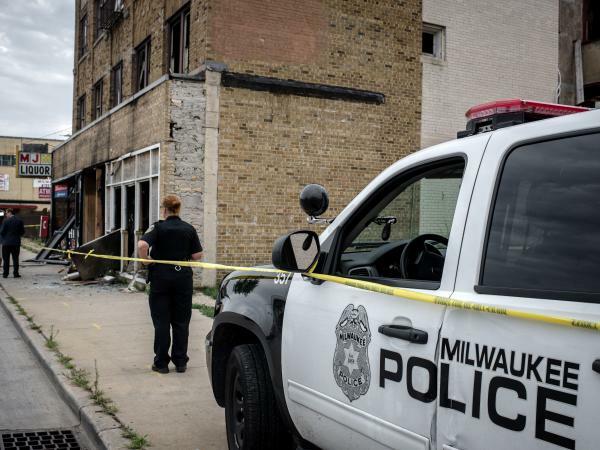 These tensions between black Milwaukeeans and the police department seem to have contributed to a crisis of legitimacy among the city's police that has only been exacerbated by several high-profile local cases of police violence. A study last year by three sociologists found that one such incident prompted residents in the city's black neighborhood to make fewer emergency calls to 911 dispatchers. "Police work of every kind relies on citizen participation, especially reports of law breaking ... If police misconduct lowers crime reporting throughout black communities, it directly threatens public safety within those communities, many of which already have high levels of crime," the authors wrote. For his part, Collins, the plaintiff in the ACLU stop-and-frisk suit, said that he simply wants younger black people in the city to be able to grow up and not take as a given that they will have random, unexplained contact with the police. "You haven't committed a crime or anything, you're innocent, you should have the freedom to flow," he said. "You don't want to be looking over your shoulder, you know what I'm saying?"